Kansas City Royals outfielder Alex Gordon had extra motivation when he took the field Friday night. He was playing in honor of Charlie, a young boy he’s known for four years and who is again battling serious health issues. Wearing a yellow arm band with Charlie’s name on it, Gordon stepped to the plate in the first inning against Cleveland Indians starter Carlos Carrasco and launched a two-run home run. When he crossed home plate, Gordon pointed to the arm band to make sure everyone knew who the home run was for. Charlie is one of several Kansas City area children who have benefited from Gordon’s Lemonade Stand Foundation, which helps support childhood cancer research. Charlie was diagnosed with a rare form of brain cancer in 2007 when he was just three years old. He was given a less than 5% chance of survival, but had battled the disease into remission. Now he’s facing another tough health battle after requiring brain surgery on Thursday. Gordon did his best to raise the spirits of Charlie and his family. After hitting a double later in the game, Gordon again pointed to the arm band as a salute. The hot-hitting outfielder had his best game of the season, collecting four hits and finishing a triple short of the cycle. 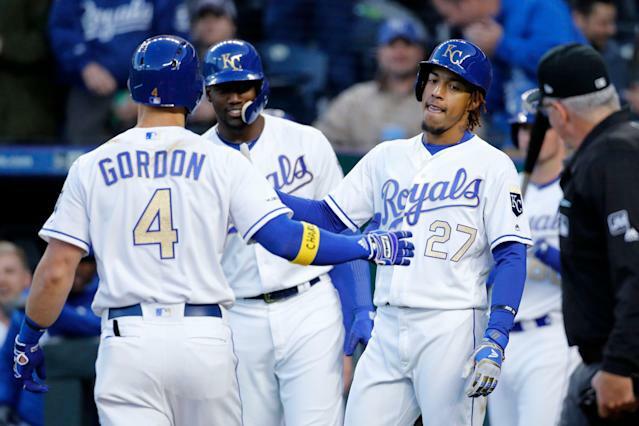 The Royals also played their best game in May, snapping a 10-game losing streak with a convincing 8-1 victory. We salute you, Alex Gordon and the Royals. And we wish Charlie nothing but the best.